Rice Krispy Treats are Spencer’s all time favorite treat/dessert. Yesterday, after a few weeks of pestering for some we finally made them. I wanted to snap a picture of the completed goodies but they were gone before I knew it. They are a great summer treat that will not make the kitchen hot. Oh, and they are good with chocolate chips added in, or a smidge of peanut butter. Melt margarine over low heat and add marshmallows, stir until metled. 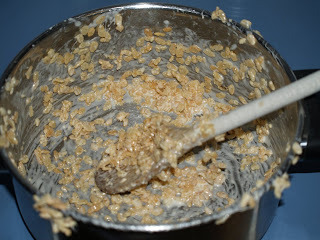 Add Rice Krispies, stir until well coated. Press mixture into a buttered 13x9x2 pan.